a GIS specialist can directly access and open the data within QGIS for further spatial analysis without downloading the data. GloFAS river discharge forecast data (river_discharge_forecast_opt2). The portal allows for the display of two-dimensional global datasets or a subset thereof (2). An additional plotting functionality (3) allows the retrieval of data points in time of individual latitude / longitude point values. One plotting functionality allows for the plotting of ERA-interim time-series data and the other plotting routine uses Python's library matplotlib for plotting a hydrograp based on river-discharge forecast data. 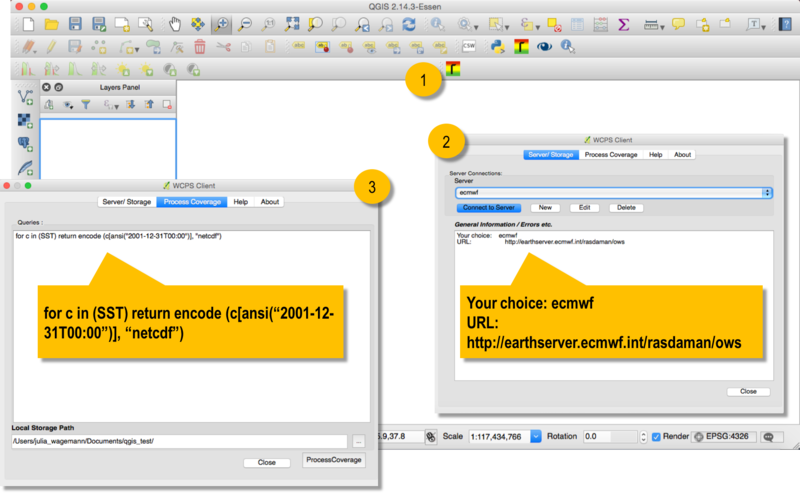 The web client can be accessed via http://earthserver.ecmwf.int/earthserver/worldwind. Demo web-client with NASA WebWorldWind. The web-client offers three main functionalities: (1) three dimensional visualisation of three global coverages, (2) executing own WCPS queries and visualize only a subset of a coverage (compare inlet) and (3) a plotting functionality of a time-series / hydrograph of individual latitude / longitude information. Examples of the two plotting services offered by the demo web client. The main image shows a hydrograph plotted based on daily river discharge forecast data. The plotting is done with Pythons's plotting library matplotlib. The inlet shows the plotting service for ERA-interim time series data. The plot shows total accumulated precipitation for one lat/lon grid point for 1 year. The plot is generated by ECMWF's plotting library Magics. QGIS is a poplular open-source desktop-based Geographical Information System that bases on the collaboration and development of people within the geospatial data community. Based on individual plugins, QGIS can be enriched with a wide range of additional functionalities. Per default, QGIS can be used as a WCS 1.1.1.1 compliant data server. ECMWF's WCS server is compliant to WCS 2.0 and gladly, there is a QGIS plugin that can be installed to be also compliant to WCS 2.0. Thapaliya & Misev (2014) built the QgsWcpsClient1 plugin, which allows to connect to a OGC WC(P)S server and to execute a WCPS query for direct import to QGIS. 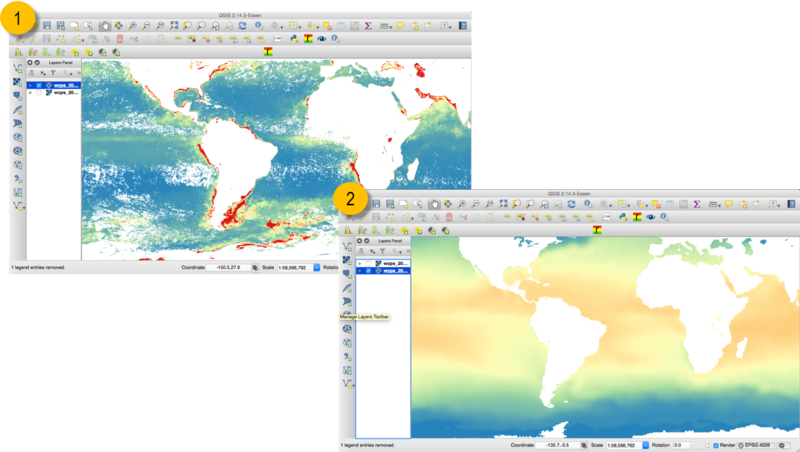 Figure below shows an example of a WCPS query executed in QGIS to retrieve sea surface temperature data from ECMWF for 31 December 2001. The QGIS desktop application and a simple three step approach to request data via a WCPS query: (1) install and load the QgsWcpsClient1 plugin, (2) connect to a WCS server endpoint and (3) request data with a WCPS query. A connection can be made either to ECMWF's service endpoint or to any other WCS 2.0 server. Once the connection is established, data on the server can be accessed via a WCPS query. Figure below shows (1) data from the Plymouth Marine Laboratory, the the marine science data provider of EarthServer-2 and (2) ERA-interim sea surface temperature from ECMWF. Two examples of a coverage requested and retrieved via a WCPS query and visualized on-the-fly with QGIS: (1) from Plymouth Marine Laboratory's web service and (2) from ECMWF's webservice. 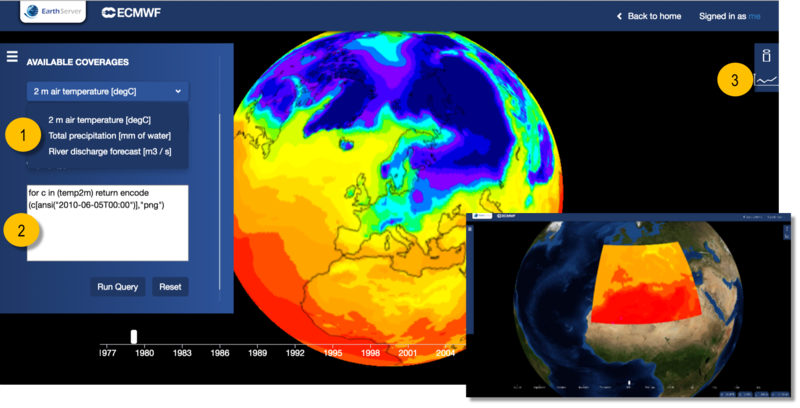 (1) shows the ocean colour from ESA's Climate Change Initiative for 31 December 2001. (2) shows the ERA-interim sea surface temperature for 31 December 2010. Rather than downloading Gigabytes to Terrabytes of data, one can simply integrate data access, processing and retrieval into any processing routine. The example below shows a simple and quick example in Python how ERA-interim 2m air temperature data can be requested from ECMWF's WCS server and directly stored python data structures, e.g a numpy-array of a python-list. This allows for further data processing or data visualisation. Format of a Web Coverage Processing Service query - Example for a 2m air temperature spatial and temporal subsetting as well as a mathematical conversion, to convert Kelvin to degrees Celsius. Add your parameters into the customized url format. The next tutorial chapter will give you an overview of available data sets that can be retrieved from ECMWF's Web Coverage Service.